Hundreds of millions of people around the world tuned in July 20, 1969, to watch Neil Armstrong’s landmark first steps on the moon, and the excitement arguably overshadowed the TV’s fuzzy, murky image. A few people, however, were treated to a much clearer show, the tapes from which NASA officials suspect might still exist — somewhere. When Apollo 11 landed on the moon, viewers around the world, as well as NASA officials at Houston, saw the dark, fuzzy images (top), which were degraded after being converted to standard broadcast format. Polaroid images ( bottom) of the footage prior to conversion show a clearer picture. That original footage is now missing. Images are courtesy of NASA kinescope archive/ Colin Mackellar, www.honeysucklecreek.net. 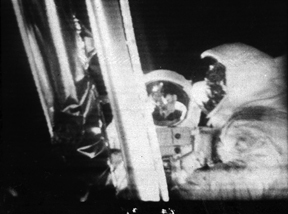 The tapes in question hold signals transmitted directly from the Apollo 11 TV camera on the moon to three monitoring stations on Earth, where the signal showed up as quality images on specially designed monitors. The few personnel working at the monitoring stations saw these original quality images, which were “far superior” to what the world saw, says Stan Lebar, who worked to design the Apollo Lunar Television Camera that recorded the moon landing. The rest of the world, including Mission Control in Houston, saw a version degraded after it was converted to accommodate standard TV broadcast formats. Starting in 2004, Lebar led a casual search, not sanctioned by NASA’s Goddard Space Flight Center in Greenbelt, Md., to find the original high-quality tapes. This past August, fearing that time could be running out for the recovery of data from the tapes, NASA spearheaded an intensified search. Dorothy Perkins, deputy director at Goddard, headed the official search. First, paper records led the team from Goddard to the National Archives in search of the approximate 2,600 boxes known to contain tapes of data from all Apollo missions. Then, additional records indicated that during the 1970s, Goddard permanently recalled individual boxes from the National Archives back to Goddard, most likely for the purpose of obtaining specific information to study past missions or prepare for future missions, Lebar says. But so far, the tapes have not turned up. “I just don’t think we’ve done enough investigation yet to know where they could have gone,” he says. An early concern for the team was the closure previously scheduled this month of Goddard’s Data Evaluation Laboratory, where the only equipment to read and view Apollo tapes is housed. After her appointment to the team, Perkins immediately made sure that the necessary equipment would remain, in case the tapes are found, Lebar says. 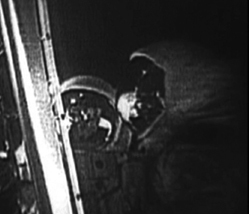 A second concern was that information on the magnetic tapes would have decayed with time, but the readability of similar tapes from a 1968 mission simulation has given the team hope.